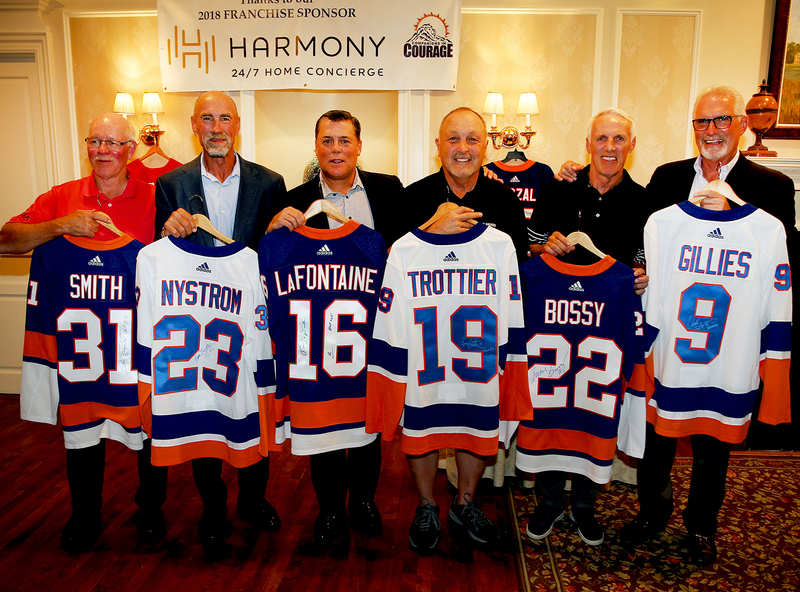 HUNTINGTON, NY, September 27, 2018 – The 16th Annual Companions in Courage Foundation Golf Classic took on epic proportions when Pat LaFontaine decided to recognize all members of the New York Islanders selected last year for Hockey’s 100, along with the members of the team who have had their number retired. Huntington Country Club on Long Island was buzzing with excitement as Mike Bossy, Bryan Trottier and Bill Smith were joined by Bob Nystrom and Clark Gillies. (Earlier in the week, Denis Potvin stopped by to autograph items, since he would be in Florida to broadcast a Panthers’ game on the day of the outing). The legendary group helped raise money and awareness for the organization that now serves almost 60,000 pediatric patients per year in hospitals throughout North America. A record number of golfers teed it up on a perfect fall day, on a beautiful golf course. Michigan artist Paul Madden spent the day completing a commemorative original drawing of the five Islanders players voted to Hockey’s 100. The piece would be auctioned at a spirited post-event dinner attended by 150. The Islander legends participated in panel discussion that included remembrances of recently passed G.M. Bill Torrey and hilarious stories of the team’s celebrating with the Stanley Cup. Mike Bossy took particular note of the charitable work conducted on Long Island, especially by his former teammates, Nystrom, Gillies and LaFontaine. Each foursome sponsor received a unique image of the retired Islander banners, personally autographed by each Islanders legend. LaFontaine introduced 32 unique double magnum bottles of The Pinot Line – a Russian River Valley Pinot Noir – created in order to donate all proceeds to the foundation. Within a matter of minutes, he had raised more than $30,000 for the charity by offering the wine and autographed jerseys from each of the legends in attendance. Harmony Home Concierge Service served as Franchise Sponsor for the day and also contributed 100 gallons of home heating oil, and a 10,000-watt portable gas generator to the raffle. Sal Paterno of Milano Men’s Fashion also generously contributed gift certificates to his Huntington men’s clothing store. Joe McMahon of the McMahon Family Foundation donated an autographed Matthew Barzal jersey that drew a lot of attention. The day was filled with poignant moments, including traditional tributes (at Amen Corner) to CiC Foundation supporters who have passed on. The golf course, and later, the dining room was filled with a spirit and enthusiasm that is contagious and inspiring. Tricia Hiller, Director of Child Life at Maria Fareri Children’s Hospital at Westchester County Medical Center delivered a stirring keynote presentation on the importance of services like a Lion’s Den Room in patient care. Her hospital is the site of the first of the 20 Lion’s Den Rooms that have opened across North America. Hiller brought tears to many eyes as she validated the value of the rooms to patients, their families and to healthcare professionals at the hospital. In addition to the Islanders legends, LaFontaine also welcomed former teammates Ken Morrow, Brian Mullen and Benoit Hogue. The field of celebrities included former NBA star Wally Szczerbiak, his dad Walter Szczerbiak, and hockey’s Pat Jablonski. CiC Foundation board member Jerry Wood, was the overall champ on the course, shooting a 68. He won a match of cards over another member of his foursome, Clark Gavin . David Lehanski, from the NHL Foundation foursome, won the Long Drive contest with a bomb on Hole # 7, while Chris Thompson (5’2”) won the Closest-to-the-Pin contest on Hole #12. Todd Carroll (in the net!) won the “Nearest-to-the-Net” contest on #18. Alex Kwiatkowski posted the Ladies’ Low Score (87) to capture that trophy. Andi Husted of Phoenix won Ladies’ Closest-to-the-Hole on 12, while Jacque Husted took the Ladies’ Long Drive on #7. The foursome of Wood, Gavin, Steve Fisher and Paul Mazzola took the low gross team honors with a score of 59. By three strokes, they bested the runner-up teams of Sean McAuley, Chris Thompson, Chris Montanaro and Rob Walter; along with Nick Patti, Jr., Mike Patti, Rob Ronne and Mike Whelan. Many golfers took advantage of pre-round massage and stretching offered by Steven Login of Golf & Body. His Huntington shop features proactive physical therapy and wellness for men and women looking to remain active. LaFontaine thanked the Franchise sponsor – Steve Goldman of Harmony Home Concierge service. He also thanked the Major sponsors that included Rob MacInnis, Striano Electric, Lombardi Design, NHL Foundation, Ferreira Construction, Sean McAuley, Jerry Wood, Delaney Contracting, Patti & Sons, Inc., TVR Communications, Unsung Siblings Foundation, Croatian-American Foundation, Discount Tire, Capital One Bank, Botto Mechanical, the Lake Placid Wreckers, Harbor Irrigation, Cameron Engineering & Associates, Paul Gillin, Soldier Design, Polymers-Merona, Valor Hockey and Sun Seven Stars Media. LaFontaine also thanked Harmony Home for sponsoring the dinner, Jim Botto of Botto Mechanical for sponsoring the Caddies; John Cameron for sponsoring the Halfway House, Jerry Wood for sponsoring the Texas Hold’em Tournament; Rob MacInnis for sponsoring the Premium Cigars; Andrew Cameron of BNB Bank for sponsoring the Driving Range. Back in February of 2005, during an awards luncheon for Long Island Track and Field, Mark Leff, a Senior Manager with Cisco Systems, and Bob Cook, owner of Runner’s Edge in Farmingdale, were talking about the possibility of putting on a race to support Companions in Courage Foundation (CIC), founded by Hockey Hall of Famer and former NY Islander and Ranger Pat LaFontaine. Cook’s thought was to put on a one-mile race. The belief was that it would be unique and would attract participants of all levels of capability. By June of 2005, North Fork Bank and Dr. Larry Lembo, a Farmingdale Chiropractor, were among the very first sponsors. During Labor Day weekend of 2005, the very first Runner’s Edge Main Street Mile was held. It attracted 180 participants and $3,000 was raised for CIC. A post-race fundraiser was once again held at The Nutty Irishman, which is located right near the finish line. Once again, more than 500 registrants took part and helped to raise a record amount of more than $18,000 to benefit CIC. Much of the success was also due to the generosity of our sponsors that included Bob Cook, owner of Runner’s Edge and presenting sponsor. Major sponsors once again included title sponsor Cisco Systems. Additional sponsors included Farmingdale Chiropractor Dr. Larry Lembo, who has been a sponsor for all 14 years of the event, the Farmingdale-based law firm of Carman, Callhan and Ingham, the Melville-based law firm of Carter, Deluca, Farrell and Schmidt, Race Awesome who did an incredible job setting up a first-class finish line, The Nutty Irishman (who donated the post-race brunch), Saucony (who donated all race shirts), Stamford, CT-based Horizon Paper and Sunpower Solar Energy Systems. Syosset-based David Lerner and Associates (sponsor of the post-race fundraiser at The Nutty Irishman), Plainview-based B&G Group and 103.1 MAX FM were also major sponsors. The co-race directors were Bob Cook, owner of the Runner’s Edge and Mark Leff of Cisco Systems, along with the race committee of Mindy Davidson of the Greater Long Island Running Club and BOCES, Craig Gluf of Universal Photonics and Jim Johnson, Executive Director of Companions in Courage. The race finish in front of the Farmingdale Firehouse and Village Hall, with the post-race awards ceremony taking place in back of The Nutty Irishman. There were a record 482 finishers in the race, 85 of them from Farmingdale, 27 from Massapequa and Massapequa Park and many from surrounding local towns such as Bethpage, Seaford, Wantagh and as far away as Waltham, MA, and Santa Monica, CA. Palmers American Grill. 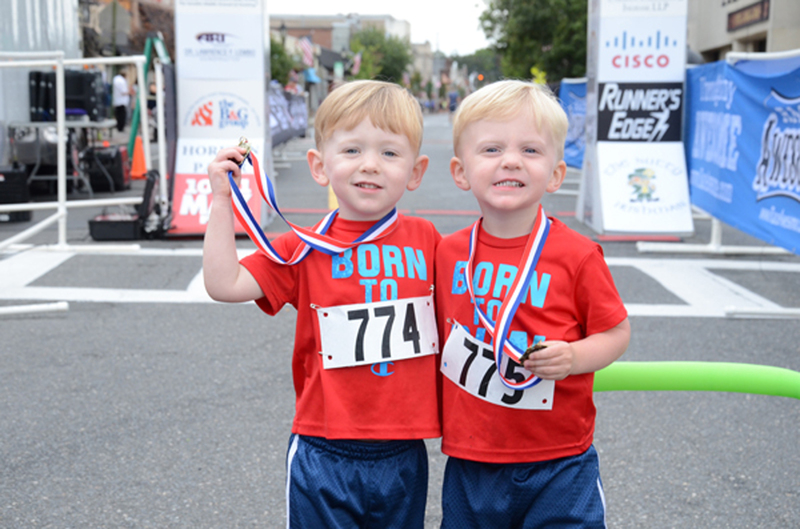 There was also a kid’s fun run where the younger participants ran a quarter-mile up and down Main Street and received medals and free ice cream from McDonalds’s on Route 109 in Farmingdale. This year’s official race photographers were Island Photography of Port Washington and Joel Harris Photography of Mineola. Dignitaries in attendance included Town of Oyster Bay Supervisor Joseph Saladino, Greg Carman from sponsor Carman, Callahan and Ingham, who is also the Deputy Town Supervisor, and Brian Harty, the Farmingdale Village Administrator. Doing the race announcing was “the Voice of Long Island Racing” Terry Bisogno. Race timing was provided by PRTiming of New Paltz, NY. The finish line and much of the race logistics were provided by Corey Roberts of Race Awesome of Seaford. The race was followed by the special fundraising event at The Nutty Irishman, who generously donated their space with a buffet for all the participants. The festivities also included a performance from the SPITunes, a band lead by Companions in Courage Executive Director Jim Johnson, and where Town of Oyster Bay Supervisor Joe Saladino played drums for one number. There was also the biggest raffle the event has ever held with numerous prizes that included a Schwinn Cruiser Bike donated by Babylon Bike, a Sony Playstation 4, a Race Awesome VIP pass for all 2019 races, and many other numerous prizes and gift certificates that also included autographed memorabilia from Pat LaFontaine. The MC for the event was The Wiseman of 103.1 MAX FM Radio who wore his infamous beanie. He brought so much energy to the event. He even played some hockey trivia games with some of the participants. The Main Street Mile once again produced great performances for both the men and women. The men’s open division (under 40 years of age) was won by Joseph Grieco of Massapequa at 4:17, followed by Jonathan Afanador of Patchogue and Yean Jimienez of Union City, NJ. In the men’s master’s division, Boyd Carrington of West Islip won with a time of 4:24, followed by Early Penney of Glen Head and David Lopez-Merols of East Northport. In the women’s open division, Jen Dagan won with a time of 4:52. She was followed by Michelle Walker and Katie McGrath. In the women’s masters division, Vivien Lim of Great Neck won with a time of 5:31. She was followed by Una Broderick and Heather Riddiough. The wheelchair division was once again won by Peter Hawkins of Malverne with a time of 3:27. The race’s oldest finisher once again was 90-year-old Bert Jablon of Syosset. In honor of Bill Benson, a well-known and loved member of the running community who was beloved at past Main Street Mile events and who passed away in 2016 at the age of 97, the “Bill Benson Memorial Award” award awarded to Bert Jablon as the race’s oldest finisher for the third straight year. Also a notable performance came from Virginia Guichard of Melville who finished with a time of 23:51 in the 80-84 year old division. There were 83 Farmingdale residents who participated and fared well in the race. Top finishers included Noelle Cutter for the women and Patrick Smyth for the men. Other participants included Anthony Diaz, Franklin Diaz, Connor Fawcett, Steve Waters, Ronnie Vichman, Trevor Gayron, John Russo, Gavin Roger Rogers, William Hammond, Leann Nicholas, Joseph Picini, Stephen Kessler, Joseph Kessler, Eamonn McLoughlin, Briana Bellando, Christine Gayron, Christine Gilleran, Kelly Bergersen, Jack Brosnan, Matthew Oppedisano, Savanna Spakalik, Hannah Wenzel, Bill Coleman, Chris Unger, Misel Diaz, Elizabeth Kaufman, Michael Beriloff, Bill Pawlowski, Christopher Hunt, Dylan Coleman, Kelsey Gallagher, Kyra Akley, Toniann Penna, Madison Burke, Emily Hunt, Michael Oppedisano, Caleb Carle, Hailee Comple, Adam Bruzzese, Kimberly Fields, Julianne McNally, Aidan Hamilton, Charlotte Luquer, Meghan Kane, George Graf, Cuinn Sunde, Julian Farrell, Jessica Beriloff, Teigan Sunde, Joseph Beriloff, Alyssa Fields, Kelly Palandro, Walter Buser, Erin Smyth, Victoria Pizzarelli, Kimberly Warshauer, Tara Syrett, Alexa Pereira, Kyle Gayron, Meredith Beringer, Dana Oppedisano, Jennifer Labas, Natalyia Hammond, David Ladd, Patricia Fawcett, Tiffany Blatz, Helen Kappel,, Elizabeth Russo, Samantha Stanton, Isha Hamilton, Tara Coleman, Janet Dawson, Robert Ryan, Joslyn Larocio, Jessica Deluercio, Tiffany Ladd, Shawn Rogers, Vanessa Damo, Christine Hopper, Suhany Longarello, Joe Sokol and Frederick Benlein. Massapequa and Massapequa Park residents were represented by 33 participants thatincluded Joe Grieco, Michele Walker, John McKeon, Thomas Augeri, Thomas Erdmann, James Porr, Erin Byrnes, Steven Simmons, Christopher Leon, Vincent Corrado, Alyse Batt, Kristina Leon, Patricia Hedderson, Christine Poplawski, Glenn Morse, Thomas Tuffy, Jonathan Fields, Lois Bentivegna, Judy Digiovanni, Norman Hershkowitz, Thomas Hilbert, Heather Riddiough, Jack Rhein, Frank Vereline, Liz Henry, John Nora, Tom Verlene, Michael Cors, Thomas Coll, Taylor Jonak, Kathy Rose, Seamus Vereline and Eileen Creaven. There were also 60 participants from the RunStart program, which is sponsored by the Greater Long Island Running Club and Runner’s Edge to help introduce new runners how to train, with the Runner’s Edge Main Street Mile being one of the races the members of this program train to take part in. Debbie Blair and Bob Cook are to be thanked for their efforts with this group. The rooms, dubbed “the Lion’s Den,” have state-of-the-art technology from Cisco Systems, Microsoft and Google. Patients receive a “smart” card when they check into the hospital, identifying them as members of a special community with unique privileges. The key is an ID device that allows each child to personalize their experience within the Lion’s Den room with activities such as web surfing, video game playing and video-conferencing. Lion’s Den playrooms in the NY area include one at Huntington Hospital, Morgan Stanley Children’s Hospital at Columbia Presbyterian in NYC, Maria Fareri Chidren’s Hospital in Valhalla, NY, Mount Sinai Hospital in NYC, and the most recent one being at Cohen’s Children’s Hospital in New Hyde Park. The proceeds from this event will go a long way toward helping children and their families in their time of need given the great work done by CIC. This is inclusive of a CIC initiative known as “Santa Connection.” a way to bring live and personal Santa visits to children in numerous hospitals around the U.S. and Canada this coming December using video conference capabilities from Google. This event will once again will be hosted at Google’s YouTube Studios in NYC in December. There are also plans to once again have the Heisman Trophy winner do children’s hospital visits via a Google video conference, known as a “hangout” this December as well. Past Heisman Trophy winner visits have included Robert Griffin III, Jameis Winston, Marcus Mariota, Derrick Henry, Lamar Jackson and Baker Mayfield. For more information on Companions in Courage, visit www.cic16.org. For more information on the Main Street Mile, visit www.facebook.com/MainStreetMileFarmingdaleCiC. View photos from the race and the post-race fundraiser, and highlights from Facebook Live.